However, Doc Rivers said that he likes the way the second unit plays together so he may even throw Sasha (remember that utterly useless guy from last season??) into the starting role just to keep his second team together for when our senior citizens get tired. The Knicks are undoubtedly going to be a lot stronger of a team than last year. Do you think we can beat them right off the bat? I believe so since they are a new team and have had limited practice, while the core of our team has been together since 2007. 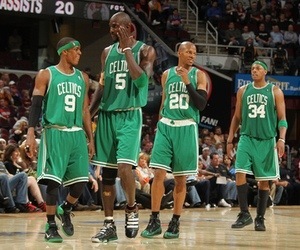 This entry was posted in Celtics and tagged carmelo, celtics, daniels, knicks, pierce by christoph131. Bookmark the permalink.